It has been a while since I updated the blog. For those that actually read it (hi Mom), I apologize. I have found myself using Twitter more and more; the concept of micro-blogging fits well into my lifestyle and attention span. To find out what I am talking about on Twitter and for more timely conversations about my explorations, follow @WalterPickel. Other members of the ADM Exploration Team that can be found on Twitter are @JoshBernstein, @JonBojar, @CurtBowen, and @EricDeister. Some are more active than others; your mileage may vary! 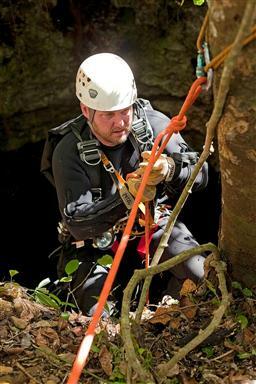 So much has been going on in the world of caving and cave diving it is almost dizzying. We, the ADM Exploration Team, kept a pretty low profile throughout the Summer and early Fall. We have been focusing on creating a close core group of explorers and setting potential missions for the next year or so. We have also been working on some local cave exploration with The Karst Conservancy right here in Central Florida. Nothing beats discovering and exploring virgin dry and wet caves right in your own backyard! Working with the caving and cave diving communities is very important to me. I am very blessed to have the opportunities I have and enjoy sharing them with others and working with others to become better explorers. My latest contribution comes in the form of FREE clinics! I recently completed the second climbing and caving clinic for 2011 and ADM Exploration Team also held a free sidemount clinic in July. The sidemount clinic was intended to introduce cave divers to sidemount diving and from what I was told, we achieved our goal. The most recent climbing and caving clinic was held in conjunction with the 2011 NACD Annual Seminar and it was a great success! I honestly never tire of watching and listening to those that are new to this side of the sport and hear the enthusiasm they gain for it just by spending a few hours in the woods and in caves. During our past clinic. I had the pleasure of working with the closest thing I have seen to a "natural" -- Anthea Ibell. Anthea is the 2011 Rolex Our World Underwater Scholarship winner! Pretty cool stuff she is doing and I expect to see her name associated with caving, diving and exploration for years to come. Our climbing and caving clinics expose participants to real world exploration scenarios. Although climbing in trees is worthwhile and great practice, nothing beats experiencing the real thing. I would like to graciously thank The Southeastern Cave Conservancy (SCCi) for being our partners in these clinics. The cave we normally use for clinics is owned by SCCi and is located in Ocala, FL. The SCCi currently owns or leases 27 preserves containing 185 caves in six southeastern states. If you are not already, I would highly recommend you join the SCCi and do your part in preserving caves that need protection or management. As concerned explorers, we have begun putting a more renewed focus on the ADM Exploration Foundation. Our foundation's mission is to further the knowledge and understanding of history and science through the exploration, research and documentation beneath the water. As you know, we have made some exciting discoveries in the past (artifacts in Mexico and Guatemala, primate fossils in the Dominican Republic). We have also worked to strengthen our knowledge and academic relationships as well as improve our in-water excavation and artifact handling procedures. Given that and the gravity of our recent cave diving expeditions and the discoveries made on them, we feel that we are uniquely positioned to help the archaeological and academic communities with underwater archaeology and look forward to more opportunities. I would like to personally thank Light Monkey, our lighting sponsor, for always making sure we have the best lighting equipment out there! If you are looking for a new light, I cannot encourage you enough to give them a call and find out what they have to offer.